“An impeccable production…bitterly funny” **** Sunday Times “An energetic and laugh-aloud-funny production…a real tour de force” Observer. Did I watch a different play then? This is certainly an "impeccable production" and it is a real "tour de force". But saying it is bitterly funny or a laugh-aloud funny production is so unbelievably far from the truth. Unless that is you think it funny to mock people with disabilities and shyness or to make fun out of those who are bullied either at school or after leaving? Or perhaps that is just a reflection on society these days? Perhaps that is what the critics thought was bitterly funny? This is a drama and a superbly acted drama at that. Many dramatic plays have numerous humourous lines in them and this play is no exception. But the occasional funny line does not turn a drama into a comedy. I cannot understand these theatre critics who work for national publications. Do they just get their free tickets and just nod off in their seats? Do they even turn up at all for the performance? 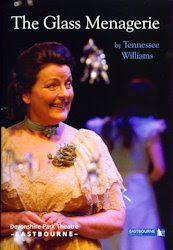 Written in 1942 I don't believe Tennessee Williams ever thought this dramatic production should ever be regarded as a comedy. The story is that of a rather eccentric, often domineering mother , Amanda Wingfield. She is very protective of her shy, crippled daughter Laura but desperate to find her a gentleman "caller" who could give Laura the wonderful life she once had before she lost both her husband and fortune. Son Tom, who spends as much time out of the house as possible to avoid his well meaning but overbearing mother, is given the task of finding an appropriate suitor for Laura. Any further information would spoil the story for anyone who has not seen this excellent drama. The play is split into 2 acts with just the one interval. Act 1: Preparation for the gentleman caller. Oscar nominated and BAFTA and Golden Globe winner Brenda Blethyn Must be one of the most powerful and versatile actresses this country has seen. Kent (Ramsgate) born Brenda has a list of theatre, TV and movie credits as long as your arm (and a long arm at that!). Theatre has included everything from the hilarious Bedroom Farce to a much more serious A Midummer Nights Dream. Amongst the film credits are Atonement, Pride and Prejudice, Saving Grace, Little Voice and Clubland. She has been equally as busy on TV War and Peace, Yes Minister, Alas Smith and Jones, Rumpole Of The Bailey and Tales of the Unexpected are just a few on the list. 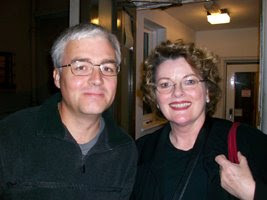 If you are a Brenda Blethyn fan there is a very good biography on Wikipedia. With a record like this you would expect Brenda's performance in this to be formidable. Amanda Wingfield's eccentric, domineering, in fact rather-mixed-up character is played perfectly. When the heavy, sometimes angry, drama is required it comes naturally, sadness is switched on with apparent ease and the moments of comedy don't disappoint. To meet Brenda was a delight, she was charming and chatty. There are occasions when award-winning actors can have a touch of the "don't you know who I am?" attitude. It certainly does not apply in this case. So....... the award winning and Oscar nominated actress was great but there are 3 much lesser known artists in this play. How do they stand up against an Oscar nominee? Extremely well is the easy answer. Mark plays poor long suffering son Tom Wingfield. Driven to despair by his mothers nagging questions of where he is all the time, her obsession with gentleman callers for sister Laura and her constant going on about her absent husband, this has to be a role played with real desperation and emotionally charged at the same time. I've never seen Mark act before but I would like to see him again. He is extremely convincing in the role. This is made all the more impressive as the role of Tom in The Glass Menagerie is a dual one between his part in the play and narrator of the story at the same time. The first act looks heavily at the strained relationship between Amanda Wingfield and her son. Mark is not at all overwhelmed by his better known actress colleague and the acting is equally as good. He already has a good list of theatre credits to his name. These do appear to be dramatic shows as opposed to lighter plays or comedies. Perhaps Mark has a preference to "serious" acting? And why not if he's an expert at it? As well as a good list of theatre credits Mark's TV appearances include The Innocence Project, Silent Witness, The Bill, Casualty and Holby City. He was also in the movies Pride and Prejudice and Mother and Son. Gentleman caller, Laura Wingfield's potential suitor, Jim O'Connor is played by Andrew Langtree. The second act in The Glass Menagerie is focused on the events between "gentleman" Jim and the shy, rather reclusive, Laura Wingfield. As, in the play, he is studying public speaking and disapproves of discrimination Jim O'Connor needs to come across as a complete charmer. This is a very different type of dramatic acting from that which is needed from Tom Wingfield's character. Andrew is great in the role of the gentleman caller and I'll cover this more in Emma Hamilton's section but the 2nd Act is very compulsive viewing. He has a good history in theatre acting. Productions including Blood Brothers, Mamma Mia (original cast) and Oh What A Lovely War! On TV he has been in Doctors, Heartbeat, The Royal, Holby City and Cutting It. I'll list all Emma's credits from The Glass Menagerie programme because, to date and compared to her fellow actors, they are short with her being a relative newcomer to the stage and screen. 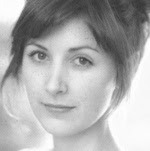 Emma trained at RADA and made her debut at the Royal Exchange Theatre. Other theatre credits include: Northanger Abbey (Salisbury Playhouse). The crippled , reclusive, Laura Wingfield needs to be played by an actress who can portray every type of emotion. Sadness, happiness, loneliness, despondence, compassion, understanding and more. So the challenging role was given to a relative newcomer to the business.................. how does she fare? In two words............. BLOODY BRILLIANTLY ! If you didn't have a programme and could therefore not compare the credits of all 4 actors you would never know that Emma's acting experience is the shortest by a long way. In the future this young actress will surely emulate the achievements of leading lady Brenda Blethyn? I'd already mentioned that Act 2 is compusive viewing. This is because the long key scene is between shy Laura and confident gentleman caller Jim. It is emotional. It has happiness. It has sadness. It has hope. It has disappointment. It has everything you could possibly squeeze into one scene and it is acted flawlessly with Emma Hamilton easily gaining huge admiration from the audience. Oscar nominee versus relative novice - who comes out on top? Neither! This is a play that is acted impeccably from all the cast and I'm sure Brenda Blethyn herself would not disagree with this opinion. The casting is spot on. We met all the cast briefly after the show and Emma Hamilton's apparent surprise that I would like her autograph perhaps demonstrates that this relatively new actress doesn't appreciate how good a performer she actually is. The Glass Menagerie really is a superb drama, particularly with this cast. But please, whatever you do, don't go expecting a hilarious comedy as implied at the very start of this review by 'official' newspaper critics and by some official advertising. You will laugh, in places, mainly at the wonderfully eccentric Amanda Wingfield. Instead go to the theatre to appreciate a wonderfully acted story with every type of emotion shown at it's theatrical best. 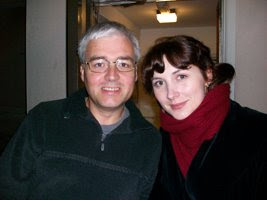 This particular cast are at the Devonshire Park Theatre, Eastbourne, until 4th October 2008. They are then off to Chichester from 6th-11th October. Enjoy it if you get the chance.